The Donna Buang search of 1953 was one of the pivotal searches in the history of Bush Search and Rescue Victoria. Bill Bewsher performed the role of Field Organiser at a time when the Victoria Police did not yet have a search and rescue squad. BSAR personnel conducted the structured searching and recovered the two missing people, stretchering them both to the road. (Source The Scroggin Eaters). One of the survivors, Jennifer Laycock, lost her legs to frostbite and the media labelled her the “Snow Girl” as they followed her recovery. 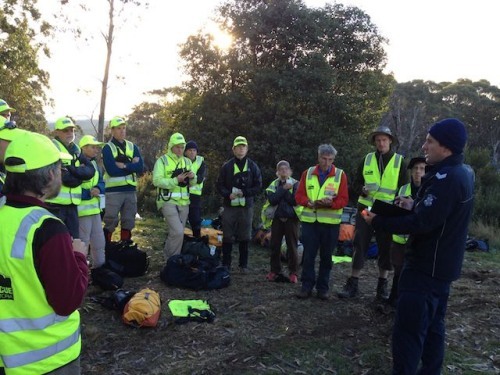 Sunday 15 April 2012 The search for the 30 year old missing hiker in the Mt Donna Buang – Badger Creek area has concluded successfully with the man being found at about 10.30 this morning. He was found on a track by a Police vehicle that was taking two Bush Search and Rescue search groups to the start points of their allocated search areas. The person is in good health. 17 Bush Search and Rescue members attended the search. Neville Byrne is a rural Police Liaison Officer with Bush Search and Rescue who who lives in Tawonga, at the base of Mt Bogong. Neville has been active with Bush Search and Rescue for 40 years as a searcher and Field Organiser.